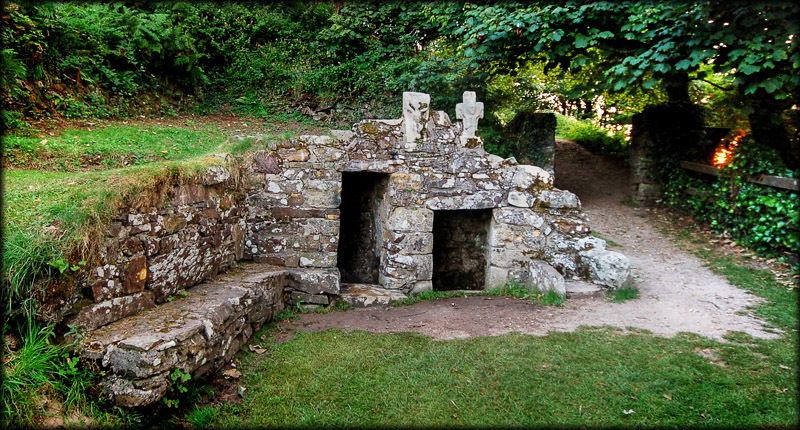 Another feature of the pilgrimage to Ardmore was St Declan's Holy Well. Declan had established a hermitage site quite close to the old monastery. The well dates back to the 5th century and is still a place of religious devotion today. On Pattern day, the 24th July, many devotees visit the well. Upon entering the grounds of the hermitage site the pilgrims make a sign of the cross using water from the well and recite prayers. They may also drink the water from the well as they leave the hermitage. 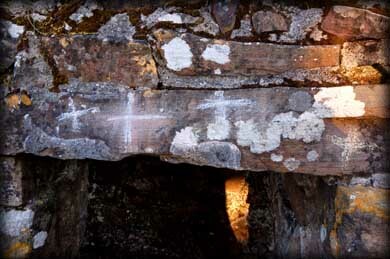 Situated on top of the well house are two carved crucifixion scenes. A visit is strongly recommended as this is a delightful well beautifully situated on the cliff walk at Ardmore. Situated: Very easy. At Ardmore follow directions for the Cliff Hotel. From here follow the trail leading to the Cliff Walk. The well is at the beginning of the walk from here. Discovery Map 82: X 1975 7734. Last visit July 2011.